Chongqing Medical University (CQMU), originally known as Chongqing Medical College, was founded in 1956, growing out of Shanghai First Medical College (the present Shanghai Medical College of Fudan University). With nearly 60 years of development, CQMU has become a major public medical university that is jointly administrated and supported by the Ministry of Education of China and the Ministry of Health of China as well as Chongqing Municipal Government. The university has a comprehensive system of academic training, from Bachelor to Master, Doctor and Postdoctoral in medicine as well as other related fields. In2013, CQMU ranks the 6th among all medical universities in China. Regarding graduate education and discipline competitiveness, our university ranks the 12th among all Chinese universities offering medical disciplines. 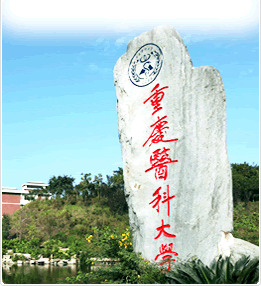 The university has two campuses, Yuanjiagang Campus and Jinyun Campus, covering an area of 2.02 km2. The total assets of the university amount to 6.78 billion yuan, among which the equipments and facilities for teaching, research and medical services are worth 983 million yuan. The library has a collection of 1.32 million books. With 19 colleges and departments, a Graduate School and an Institute of Life Sciences, CQMU offers 7 postdoctoral programs, 38 Ph.D. programs, 86 Master’s programs and 27 specialties for undergraduates. There are 218 Ph.D. supervisors. At present, a total of over 27,000 students are studying in the university, including over 500 Ph.D. students, about 4,200 postgraduates, over 20,000 undergraduate students and over 600 foreign students from 20 countries. There are 6 affiliated hospitals directly under its administration, which are all rated as “Upper First-class Hospital (3A)” in China. There are more than 10,000 beds in the hospitals. The annual outpatient visits reach 7.9 million and the annual inpatient visits reach 390,000. Besides, the university has more than 30 teaching hospitals and other 9 affiliated hospitals indirectly under its administration. The other 3 affiliated hospitals are now under construction. It has over 2229 faculty members, of whom 1482 are professors and associate professors. Many of them enjoy the State Council Special Allowances or have been selected into some national programs, such as Project for Millions of Talented People of New Century, Cheung Kong Scholar & Innovative Team Program, Project for New Century Excellent Talents in Universities and Project for Trans-century Talents. The university has 4 state key disciplines and 76 municipal key disciplines. It has 43 research institutes, 17 of which are at national and municipal level, including 3 key laboratories of Ministry of Education, 1 state key laboratory of Chongqing and Ministry of Education, 1 national and 5 municipal engineering research centers. CQMU has accomplished many research projects of various levels, including some state-level projects supported by National Basic Research Program (known as 973 Program), National Hi-Tech Research and Development Program (known as 863 Program), Key Program of National Natural Science Foundation. CQMU ranks the 47th in all the universities regarding the publication in core journals in China. Since 2011, CQMU has won national and municipal awards over 60 times in science and technology. The High-intensity Focused Ultrasonic Therapy System (HIFU), which was initiated by CQMU, is the first large-scale medical equipment with completely independent intellectual property rights in China. It has been put into use in over 1000 major hospitals in China and exported to over 10 countries and regions, such as UK, Japan, South Korea and Singapore, etc.. Being active in national and international exchange and cooperation, CQMU has established collaboration-relationship with universities in many countries and regions, including USA, UK, Canada, Japan, France, Germany, Australia, Belgium and Netherland. Recently, the university has built up cooperation with Universite Libre de Bruxelle in Belgium and Medical Colleges in Bordeaux University, University of Strasbourg, University of Paul Sabatier and University of Bretagne Brest in France in clinical education, medical research and co-cultivation; CQMU has been cooperating with Michigan State University in USA, Centennial College and Humber College in Canada in all-level nursing training, has been working with University of Cincinnati in USA to build up an International College of Medical Sciences, and has been academically exchanging with UCL Medical School specially in lipid research.